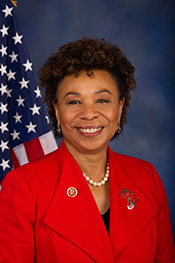 Barbara Lee in Black Americans in Congress, 1870-2007. Prepared under the direction of the Committee on House Administration by the Office of History & Preservation, U. S. House of Representatives. Washington: Government Printing Office, 2008. Barbara Lee in Women in Congress, 1917-2006. Prepared under the direction of the Committee on House Administration by the Office of History & Preservation, U. S. House of Representatives. Washington: Government Printing Office, 2006. Lee, Barbara. Renegade For Peace & Justice: Congresswoman Barbara Lee Speaks For Me. Lanham, MD: Rowman & Littlefield Publishing Group, 2008.